Gov. Bill Haslam says he is personally leading the search for a new head of the state Board of Regents because an era of dramatic change is at hand, reports the Times-Free Press. “As the Tennessee Board of Regents transitions to having a different look, this new chancellor position is critical,” Haslam emphasized last week as a 16-member search committee got underway. Haslam was alluding to his major overhaul of the TBR system that now includes six universities, 13 community colleges, including those in Chattanooga and Cleveland, and 27 colleges of applied technology. As a result of Haslam’s FOCUS Act, approved by lawmakers earlier this year, the Tennessee Board of Regents in 2017 will shed its six universities, which will operate independently with self-governing boards. The regents will focus on a new core mission for community colleges and technical schools, one that’s central to Haslam’s Drive to 55 initiative that calls for 55 percent of Tennesseans to have college degrees or technical certificates by 2025. All this comes as Tennessee basks in national attention over its Tennessee Promise program that offers free, last-dollar lottery-funded scholarships at TBR schools to state high school graduates. The other members include five regents, faculty, student, alumni, business and community leaders Nashville…He hopes the nominee can be approved by the full Board of Regents in December and start work in January. This entry was posted in Bill Haslam, Higher Education and tagged Bill Haslam, Board of Regents, higher education on September 4, 2016 by Tom Humphrey. NASHVILLE, Tenn. (AP) — Tennessee Promise scholars can perform community service hours with events planned across the state later this month. State parks and natural areas are offering the events on July 23 at all 56 parks. The student volunteers can clear brush, limbs and invasive plants; plant flowers; build trails; assist with community events; or maintain historic features. The Tennessee Department of Environment and Conservation said in a news release the projects are designed to beautify the parks and natural areas and provide meaningful outdoors experiences for the volunteers. Tennessee Promise provides tuition-free community and technical college to recent high school graduates. This fall, all Tennessee Promise students using the program are required to complete eight hours of community service by Aug. 1. For a list of events and to register, visit http://www.tnstateparks.com/about/special-event-cards/tn-promise-saturday or contact Nancy Schelin at (615) 532-5249 or nancy.schelin@tn.gov. This entry was posted in Higher Education and tagged higher education, parks, tuition on July 8, 2016 by Tom Humphrey. NASHVILLE, Tenn. (AP) — Gov. Bill Haslam has announced the launch of a $2.4 million program that will provide college counselors to 30 public high schools across the state. The aim of Advise TN is to realize the state’s goal to increase the number of Tennesseans with a postsecondary degree to 55 percent by 2025, the governor’s office said in a statement last Thursday. Counselors will be hired and trained in the summer and will work with about 10,000 juniors and seniors statewide. They will help students prepare for the ACT, work on college applications and take advantage of the Free Application for Federal Student Aid program offered by the U.S. Department of Education. To be eligible, high schools must have average college-going rates that fall below the state average. Public high schools must apply to participate and will be selected by the Tennessee Higher Education Committee based on their commitment to creating a college-going culture. Advise TN was included in Haslam’s 2016-17 budget with funding of $2.5 million. High schools selected to participate in Advise TN are expected to develop plans to continue the program after state funding has ended. This entry was posted in Bill Haslam, education, Higher Education and tagged Bill Haslam, counselors, higher education, schools on May 23, 2016 by Tom Humphrey. For the first time, all six four-year universities in the Tennessee Board of Regents system will offer big discounts in out-of-state tuition to some students this fall, according to WPLN. To get the discounts, students must live within 250 miles of the university and have high ACT scores. This new rule covers a wide area. Take Tennessee State University: If you put the school in the center of a circle, and draw radius of 250 miles in all directions, you cover as far north as Indianapolis, northwest to St. Louis, east to Asheville, and down to Atlanta. TSU senior Jordan Gaither is from Atlanta. He and his parents currently pay all his tuition out of pocket. “With me being an out of student, it is definitely a lot,” he says. This kind of 250-mile program first started in 2014 at the University of Memphis. The campus is right on the border, and it already gave in-state tuition to students from neighboring counties, but the school wanted to attract more students from the whole region. Vice-provost Steve McKellips says some students might even stay in Memphis after college. “This is a major initiative that helps the university, helps the community, helps the workforce development, helps the students — it kind of has a win on all four sides,” he says. This entry was posted in Higher Education, neighbor states and tagged Board of Regents, higher education, other states, tuition on May 20, 2016 by Tom Humphrey. NASHVILLE, Tenn. — A bill allowing staff and faculty at Tennessee’s public colleges and universities to be armed on campus became law Monday without the Republican governor’s signature. But the governor acknowledged that the final version of the measure had addressed concerns raised by college administrators during the legislative process by including provisions protecting schools from liability and a requirement to notify law enforcement about who is armed on campus. “Ultimately, this legislation was tailored to apply to certain employees in specific situations,” Haslam said. The law, which allows faculty and staff with state-issued handgun carry permits to carry, is more limited than a bill awaiting a decision by Georgia Gov. Nathan Deal. That measure would allow anyone age 21 and up to carry a concealed handgun on campus with the proper permit. This entry was posted in Bill Haslam, Guns, Higher Education, Legislature and tagged Bill Haslam, guns, higher education, legislature on May 2, 2016 by Tom Humphrey. 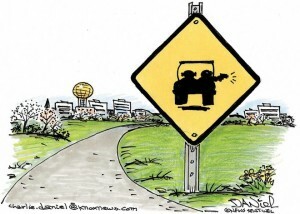 This entry was posted in Guns, Higher Education, Legislature, Political Humor and tagged cartoon, guns, higher education, legislature, university of tennessee on April 21, 2016 by Tom Humphrey. During an emotional speech Wednesday, Rep. Mark White announced he would not revive his bill to secure in-state tuition for undocumented immigrants at public colleges, ending a years-long effort that won support from colleges and Gov. Bill Haslam. White, R-Memphis, said earlier this month that he was optimistic the bill would return to the House floor before the end of the session. But while discussing the House effort to override a veto on the Bible bill, White remarked that he would not try to get the bill passed because it did not have enough support. White said undocumented students cried in his office Tuesday when he informed them of his intentions. More than 100 undocumented students had traveled to the Capitol last week to encourage legislators to reconsider the bill, which passed the Senate last year but failed in the House by one vote. This entry was posted in Higher Education, immigration, Legislature and tagged higher education, immigration, legislature, tuition on April 21, 2016 by Tom Humphrey. The House sent to Gov. Bill Haslam Wednesday a bill that will allow full-time employees and faculty members at Tennessee’s public colleges and universities who have handgun-carry permits to carry their guns on campus. The bill, which passed the Senate 28-5 on Tuesday, won House approval on a 69-24 vote. The bill does not allow students with permits to go armed. Senate Bill 2376 also contains provisions banning employees from going armed in sports stadiums and arenas while public events are underway there and during conferences with administrators regarding their job performance and tenure. House Minority Leader Craig Fitzhugh, D-Ripley, said a survey of University of Tennessee faculty members that he received Tuesday found 86 percent of the faculty at the University of Tennessee were against the guns on campus bill. Rep. Mike Stewart, D-Nashville, read aloud emails from UT professors who said they would leave the state if the bill passes. The bill requires employees who decide to go armed on campus to notify the local law enforcement agency with primary jurisdiction over the campus of their intent to go armed, but it keeps such information confidential from students, other employees and campus administrators. This entry was posted in Guns, Higher Education, Legislature and tagged guns, higher education, legislature on April 20, 2016 by Tom Humphrey. NASHVILLE, Tenn. (AP) — The state Senate on Tuesday voted to allow faculty and workers with handgun carry permits to be armed on the campuses of Tennessee public colleges and universities. The bill sponsored by Sen. Mike Bell (SB2376) passed on a 28-5 vote, and the House was expected to take up the measure on Wednesday. Republican Gov. Bill Haslam raised concerns about the measure for not giving institutions the power to opt out of allowing more guns on campus. Bell, R-Riceville, was dismissive of the results of a survey of faculty at the University of Tennessee in Knoxville that largely opposed to measure. “I think some of these people need to take their medication,” Bell said, adding that he hopes some professors will follow through on vows to quit if the bill becomes law. “Maybe this will give UT a chance to hire some conservative teachers if we have a mass exodus of some of these liberals who responded to this,” he said. This entry was posted in Guns, Higher Education, Legislature and tagged guns, higher education, legislature, university of tennessee on April 19, 2016 by Tom Humphrey.